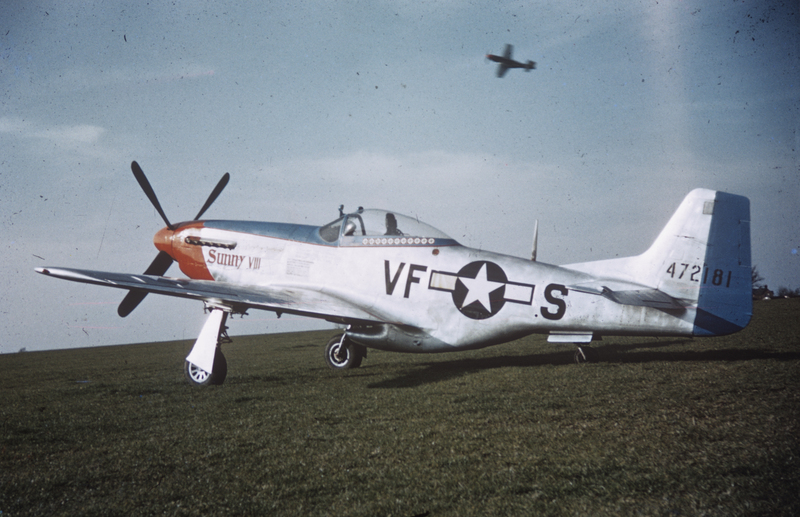 A P-51 Mustang (serial number 44-72181), nicknamed "Sunny VIII", flown by Colonel Everett Stewart, of the 4th Fighter Group - Debden. Handwritten on slide case:"Col Stewart's acft 8 x 10 N+ VFS 472181 G. Weckbacker" Taken by CWO Edward Richie. A P-51 Mustang (serial number 44-72181), nicknamed "Sunny VIII", flown by Colonel Everett Stewart, of the 4th Fighter Group - Debden. Handwritten on slide case:"Col Stewart's acft 8 x 10 N+ VFS 472181 G. Weckbacker"
Edward Richie took many of the colour photographs of the 4th Fighter Group that are in the American Air Museum's Roger Freeman Collection. "The image of Webster's kite "Sunny VIII" with the P51 peeling off overhead is also by CWO Edward Richie" according to Richie's son, Mark Richie.